The Help menu contains commands for access to this reference system and other help documents. Help Index (F1) - Opens this help system. If you are using FL Studio offline, download the offline help. See here for details. Product information - Click here to find out more about Image-Line products. Register access to website - Takes you to the 'MY ACCOUNT' section of the Image-Line website. Diagnostics - This is a separate program to perform various diagnostic and troubleshooting functions. On starting the Diagnostic will perform an installation and system scan, so be patient. 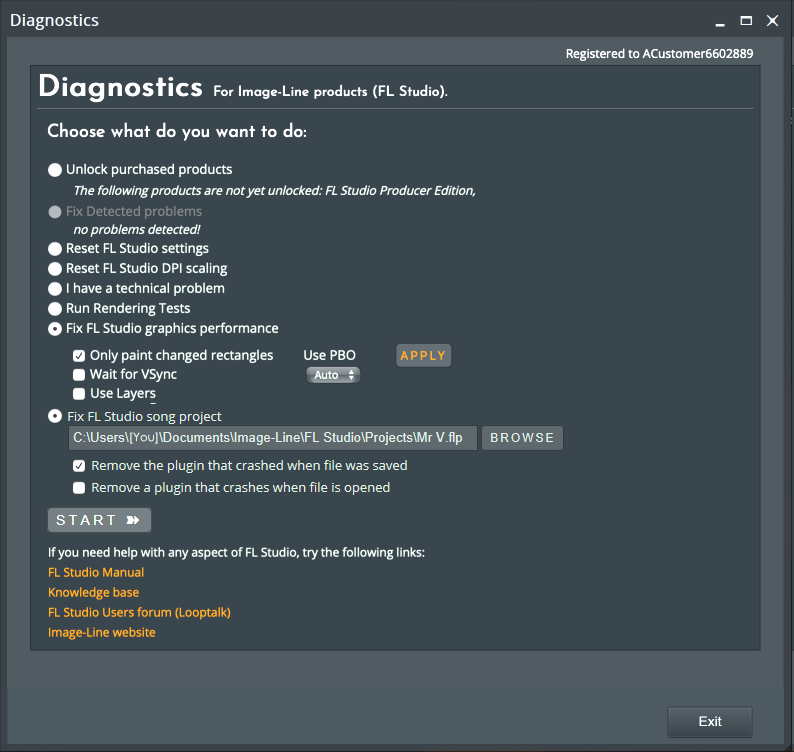 It's recommended to close FL Studio after launching the Diagnostic Tool. You can also use the Diagnostic to help Techsupport understand any problems you may be having. The tool includes some project file (.flp) recovery features to help you recover corrupted projects. 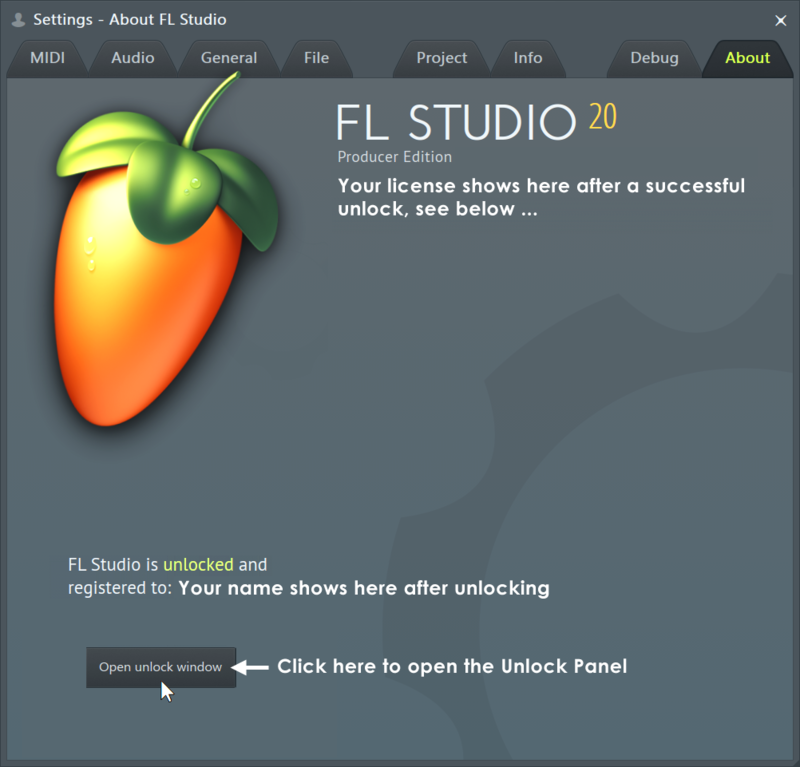 Unlock purchased products - The same unlock system as used on the FL Studio About panel (see below). Fix detected problems - Some issues can be automatically fixed. If these are detected you can use the option. Reset FL Studio settings - Restores all FL Studio settings to the default state. Reset DPI Scaling - Resets FL Studios scaling to the default. This can be useful where a setting prevents FL Studio from launching correctly. I have a technical problem - Uploads the diagnostic results to Techsupport and allows you to create a post. This feature is only available to registered FL Studio owners. Only paint changed rectangles - When this option is turned on then the user interface will only repaint the areas of windows that have changed. This can fix screens or windows showing red. When it is OFF then the whole window will always repaint. Set this to ON, unless you experience graphical glitches. Wait for VSync - When this option is turned on then FL Studio will wait for the next vertical refresh period of your computers monitor before repainting. Set this to ON unless you experience graphical glitches. Use PBO - Allow FL Studio to use the PBO OpenGL extension for faster graphical updates. Set to Auto to allow FL Studio to decide when to use it. If you experience slow screen updates then experiment with setting this to ON or OFF. Use Layers - Not used in FL Studio 20.1.2 and later. NOTE: Mouse scrolling issues. If it's too slow, set SNAP to 'Line' in the Playlist, Piano roll and Event Editor. Run rendering tests - Renders audio from all plugins and through all FX. The results are shown in a HTML file. Red results are not necessarily bad, but Techsupport may ask to see these. Fix a FL Studio song project - Allows you to selectively remove plugins from a project before loading them. This is useful when a plugin is crashing on load, preventing the project from being used. Remove the plugin that crashed when project was saved (Automatic) - The Diagnostic Tool will attempt to detect a problematic plugin and remove it. If this method fails, use the manual method below. Remove a plugin that crashes when file is opened (Manual) - Manually select and remove plugins that you suspect may be causing problems in your project. NOTE: Third party plugins are only identified as 'Fruity Wrapper', so this option will require trial and error to remove a specific plugin from the project. FL Studio homepage - FL Studio website. FL Studio mobile - FL Studio Mobile website (Android, iOS and Windows App). FL Studio tutorials - Links to the Image-Line YouTube video tutorials channel. Image-Line - Global Image-Line website, the mothership! LAME .mp3 encoder homepage - Take you to the homepage of LAME .mp3 Encoder. LAME .mp3 Encoder is integrated in FL Studio and can be used to export .mp3 files. Despite the name, this is arguably the best quality encoder available. SoftVoice Text-to-Speech homepage - A link to the Softvoice Inc. website, the speech synth as used in FL Studio. About... - Opens the 'About' box to display version number, credits, program unlock etc. When registered, your license will show where noted. Unlock with account (Online method) - Enter your Image-Line Account login, agree to terms & click 'Unlock with account'. FL Studio will restart and your installation will be unlocked. Unlock with file (Offline method) - Use 'Unlock with file' to unlock FL Studio on a computer not connected to the internet. Download your 'FLRegkey.Reg' file from your Image-Line Account and copy it to the computer you want to use. Then use 'Unlock with file' and browse to the 'FLRegkey.Reg' file and select it. After restarting FL Studio your installation will be unlocked. NOTE: This method can also work in cases where the 'Unlock with account' method is failing for some reason.